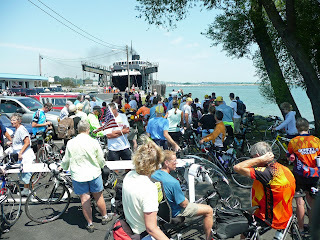 A little biking, A tour of Ludington Maritime Museum, a wedding and a big boat ride. A relaxing, busy, fun day. 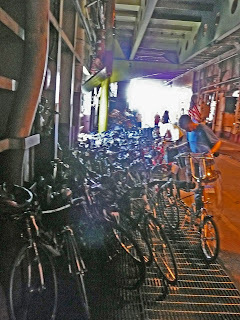 We did ride, but barely. This was a fun, “feel-good” day that was really a break from our forced march across America. Severe clear, pleasant perfect temperatures. I only learned of one incident from Ernst, the Governator of Idaho. On the deck of the Badger he shared with me an injury he sustained while doing battle in one of our food lines. Look closely at the photo below, it is not easy on this trip! Above our bikes are stowed for the 4 hour journey across lake Michigan. I am not quite sure what happened, but the night before I fell asleep at the computer around 8pm, leaving a row of kkkkkkkkkkkkkkkkkkkkkkkkkkkkkkkkkkk’s on the screen. After repeating that a few times I decided to hit the hay early. I proceeded to sleep for a most of the night. I did not hear Rich get up at 6:30 am to go to breakfast. He wakes me up when he comes back at 8:00. We pack up, load the box and Rich takes me over to have a nice breakfast at Starbucks! It was relaxing, we got to eat outdoors and enjoy the beautiful day. Afterwards we toured the town a little and got to spend a few hours in the Manitowoc Maritime Museum which was surprisingly interesting. They have a WWII submarine on display, floating in the river adjacent to the museum. They happened to have a sailor to talk with us who actually loaded and fired torpedoes on that very submarine. 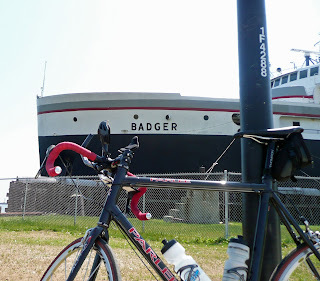 After the tour we pick up a sandwich to go from a local restaurant and hop on board the “Badger”. 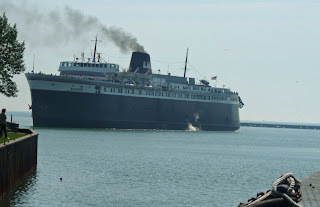 The largest car ferry maybe in the world or at least the great lakes. It was big. It was built in 1953, had state rooms, a cruise director, restaurant, etc. etc.. The ride took four hours but it went fast. I spent most of the time on the upper deck outdoors enjoying the stories and company of fellow riders, Gerard, Lenny, John Knapp, Joel Paine, Ernst, Russell and others who came and went. Once on land again we managed to have a nice dinner at “Lucciano’s” in Ludington MI. A very nice experience with the Mendelshons, Knapps, Gerard and I. Rich high-tailed it back to the hotel and got his blog updated. Sorry Mom, I got distracted by a nice meal Forgive me please! Catalogue Our Dastardly Prices at www.Pharmashack.com, The Powerful [b][url=http://www.pharmashack.com]Online Panacea pusher's [/url][/b] To [url=http://www.pharmashack.com]Buy Viagra[/url] Online ! You Can also Visualize Spectacular Deals When You [url=http://www.pharmashack.com/en/item/cialis.html]Buy Cialis[/url] and When You You [url=http://www.pharmashack.com/en/item/levitra.html]Buy Levitra[/url] Online. We Also Cantrip a Elephantine Generic [url=http://www.pharmashack.com/en/item/phentermine.html]Phentermine[/url] In brace of Your Intake ! We Hawk Become splotch [url=http://www.pharmashack.com/en/item/viagra.html]Viagra[/url] and Also [url=http://www.pharmashack.com/en/item/generic_viagra.html]Generic Viagra[/url] ! You could easily be making money online in the underground world of [URL=http://www.www.blackhatmoneymaker.com]blackhat twitter[/URL], Don’t feel silly if you have no clue about blackhat marketing. Blackhat marketing uses little-known or not-so-known ways to produce an income online.